Online repositories hold a huge range of educational materials that encompass learning objects, video, audio and structured courses. The range of choice can be a deterrent for experienced learners and is even more so for those who are tentative and lack confidence. Complexity and choice becomes a barrier to the effective use of open educational resources (OER) in widening participation. In this context a new initiative by the Open University in Scotland is really welcome. Open Pathways builds on a similar scheme developed by OU colleagues in Wales to support journeys from informal to formal learning. The materials are available as a hard copy pack and online on OpenLearn and are aimed at non-traditional students interested in engaging with education. The approach is quite simply to show how informal learning opportunities can lead to more structured access study and then on to formal accredited higher education modules and qualifications. Each pathway contains carefully curated options for informal learning using free open courses through to access modules and then on to accredited modules at SCQF level 7. The aim is to give learners confidence about where to start and a sense of structure to support progression. Within the three broad pathways there is still considerable flexibility to choose options that are of interest and relevance. The materials include simple tools that encourage a reflective approach to study and to negotiating within, through and between pathways. Many non-traditional learners make the transition into education with the encouragement and support of a trusted intermediary. 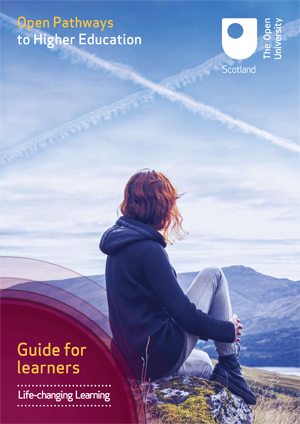 The initiative also aims to support individuals who play this ‘trusted advisor’ role to develop skills as ‘open learning champions’ and the materials include a dedicated guide which explains how Pathways can support them to advise and encourage potential leaners in ways which make use of social context and peer support.